This entry was posted on November 23, 2009 at 12:01 am	and is filed under Uncategorized. Tagged: bridge, Clyde, Glasgow, reflection, river. You can follow any responses to this entry through the RSS 2.0 feed. Both comments and pings are currently closed. Beautiful shot, it looks great in b+w. The water does look unnaturally still. Beautiful! Aside from the very calm water, it helps that the bridge itself is also architecturally interesting. That is still. It looks just like a mirror. I bet it flowing faster now after all the rain. Marvelous. 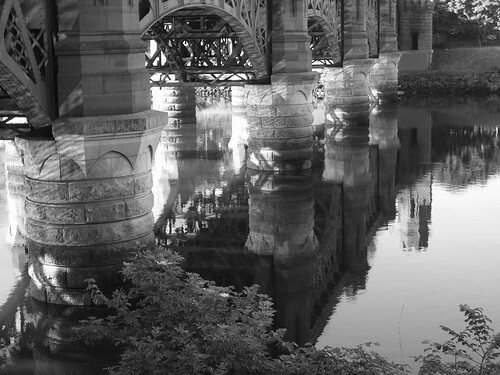 Who knew an elderly bridge could look so elegant in it’s calming skirted reflections.